Record-breaking numbers of people tuned in to what has been our most comprehensive digital Glastonbury offering to date. This year, we gave our audience the opportunity to watch what they wanted, when they wanted and how they wanted. And they did. In 2013 the BBC brought audiences the most comprehensive digital coverage ever, with live-streams from the six key music stages, over 120 live performances and more than 250 hours of live coverage across multiple screens. There was no ‘specific’ demographic for this project, as it is a ‘website maker’ with any number of potential uses (the first site’s to use the system: ‘Hackney Weekend 2012’ and ‘T in the Park’ both have 18–35, Radio 1 / 6 crossover audiences, while another upcoming event, Radio 3’s ‘Free Thinking’ is a 35–55 Radio 3 / 4 crossover). A significant ‘audience’ in terms of this project was the BBC editorial teams. 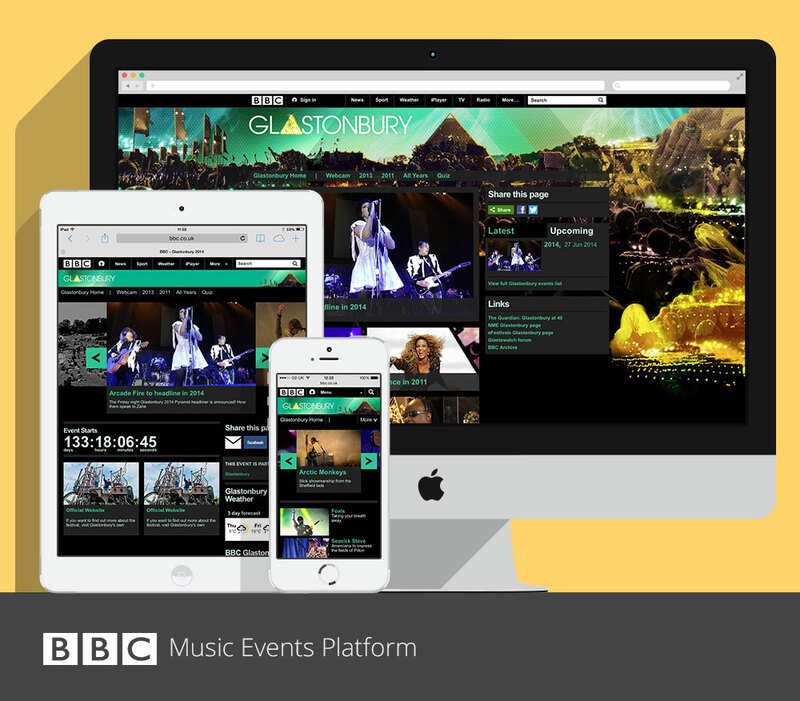 Over the last few years, the BBC has utilised a semi-automated/semi-hand built template system, called the MMFT, to create websites to support their coverage of music festivals. Whist the sites produced (several by Picture) were always comprehensive, high-spec, high-content and design value, and well received, they were also difficult to produce, time-consuming and costly, and because of the hand made aspects, very easy to break. The aim behind Eavis was to take the common editorial requirements for these websites, and produce a platform (with CMS) for quickly producing them, reducing development overhead, without reducing the quality of the delivery, and allowing the editorial users to focus on the quality of the content. Now in phase 4, we were responsible for the Strategy and delivery of the CMS. This included the overarching project management, UXD, design and the front end build. The fruits of which allow the BBC to boot out a web site with an editorial lead, big or small for any event in matter of days rather than weeks/months. Phase 3 saw additional functionality for ‘phablet’ (phone and tablet), a live media stream and IPTV capacity, it launched for Glastonbury 2013. 250 hours of content (video, photography and copy) in 7 days went into this site, with 8 or 9 different stages and other locations, 22 concurrent live media streams.